The other day, I signed up with Commission Junction to kick start my money making plan through affiliate marketing. After I completed the signup process, I received an email from Commission Junction with my login information, which included a random and hard-to-remember password (something like Q7IyhGN) to use for my first login. Today, I remembered that I should change that default password to something that’s easier to remember. So I logged into Commission Junction and tried to do that. Alas, I couldn’t figure out how to get to the page where I could change my password. Some parts of Commission Junction’s user interface have some serious usability issues. So, as usual, I had to do some Googling. Now I know how and that’s why I’m sharing the complete steps with you. Follow these steps to change your Commission Junction password. Go to www.cj.com, and then log in to your Commission Junction account. Use the default password that Commission Junction emailed to you. On the menu, click Account. On the Administrative Settings tab, scroll down to the User Settings section bottom of the page, and then click the Edit link that is on the same row as your name. The Reauthenticate Password page appears and prompts you for your current password. Type your current password, and then click OK. The Edit Contact page appears. In New Password, click Create new. Two text boxes appear. 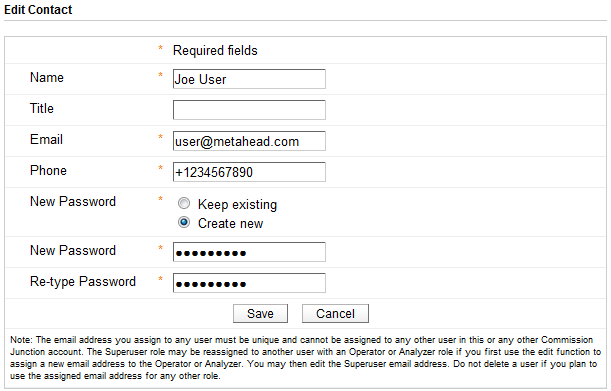 In the New Password text box, type the new password that you want to assign to your Commission Junction account. In the Re-type Password text box, retype the same password to confirm. You have completed changing your Commission Junction password. Now let’s hope their user interface designer sees this post and realizes that he needs to make the change password function more visible and usable. If you’re unable to change your CJ password using these instructions, let me know by leaving a comment. Astounding. I would never have found that “Edit” link in step 3, and even if I had, I wouldn’t have known that step 4 would bring up the Contact page to change my password. “Serious usability issues” is a serious understatement! Thanks for helping me ease my stress level. @Asian Wonder: Glad I’m able to be of help! Sorry for the late reply; I seem to have stopped receiving notifications when visitors submit comments. thank u so much….CJ is new to me and not very friendly to use. I was getting pissed. Dude, you are a freaking gift from heaven! I was racking my brains for nearly a week trying to figure this nonsense out. Sometimes I wonder if the idiots that develop the interface ever use it. Anyway, thanks for the very clear and concise post. Keep it up bro!